Posted by sarahsjoys in Appetizers, Sauces, Jams, etc. 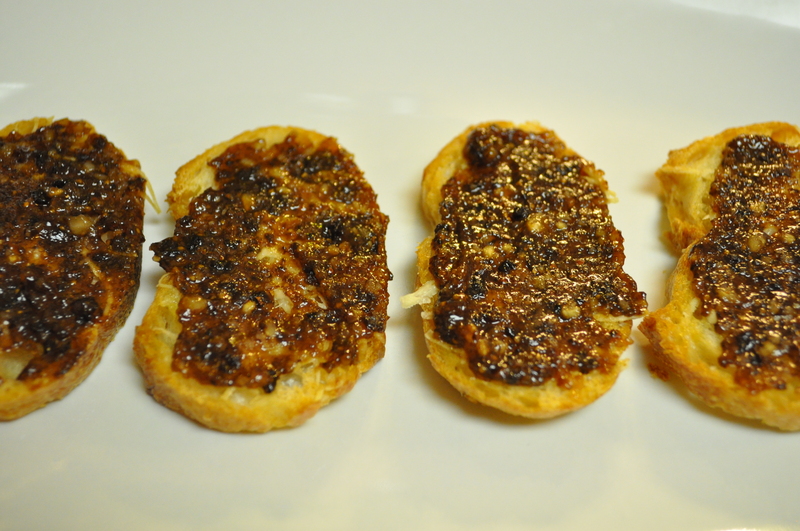 Sweet, salty and tart all balance each other out in this wildly popular appetizer. I first made this for the bridal shower of my best friend, Bethany. It was a huge hit and has been my go-to appetizer ever since. Looking at my calendar, I will probably be blogging with a little less frequency over the coming weeks but with the holidays upon us there are a couple of recipes that I wanted to get posted and this was one of them. If you are looking for home-made gift ideas, a jar of the brandied fig jam along with a copy of this recipe is a great idea. I have only slightly modified the original recipe, serving it on crostini you can make the day before to make life simpler the day of your big event. 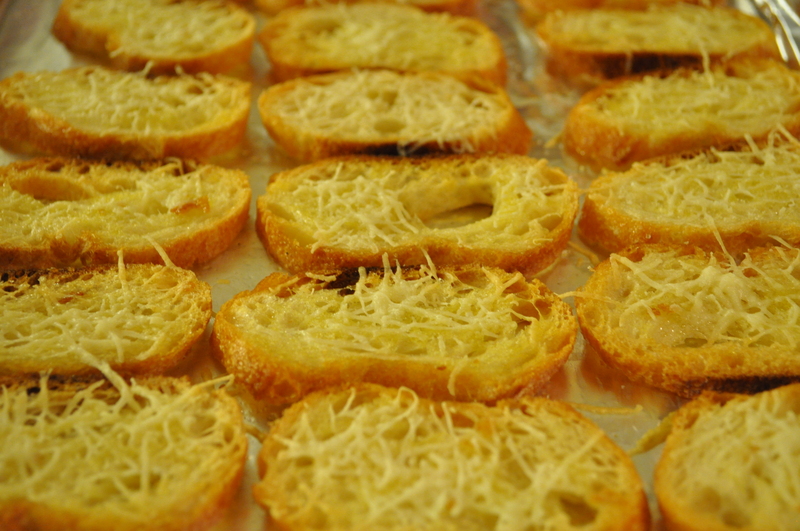 The original recipe is from Giada de Laurentiis, and the crostini recipe is from Michael Chiarello. The jam and crostini can both be made ahead of time. I also frequently slice up the Pecorino Romano the day before. It makes assembly much easier right before guests arrive. Brush the bread on both sides with the olive oil and season lightly with salt and pepper. Arrange on a baking sheet and bake until crusty and brown, about 10 to 12 minutes. Turn once about halfway through cooking, and dust with Pecorino Romano if using. Serve hot, warm, or room temperature. Store in an airtight container for up to 2 days. Place a small saucepan over medium heat. Add the figs, simple syrup, and brandy. Bring the mixture up to a simmer. Turn off the heat and let sit for 10 minutes. Place the fig mixture and the hazelnuts in a food processor and blend, pulsing a few times, until pureed. Set aside. This can be made ahead of time. If it has been refrigerated, warm the jam slightly before assembling. I made the jam a couple of weeks ago so I do not have photos of that process. 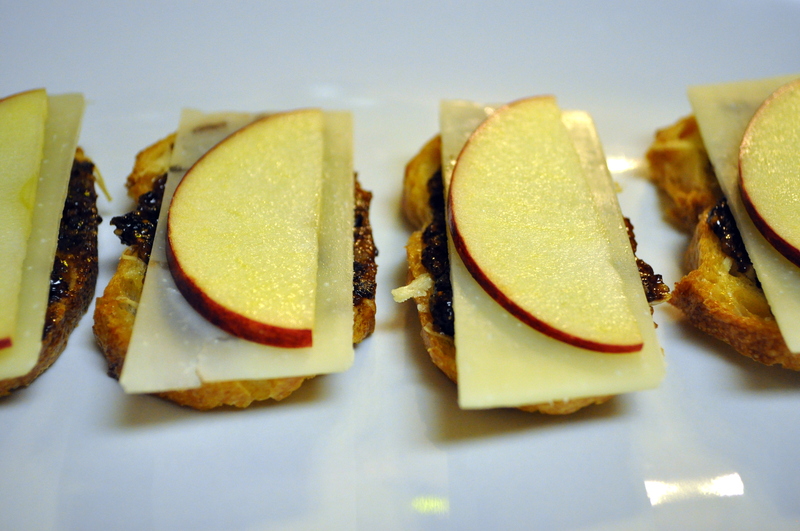 Top each slice of toast with 2 teaspoons of fig jam, a slice of apple and a thin slice of Pecorino Romano. Transfer the toasts to a serving platter and serve. 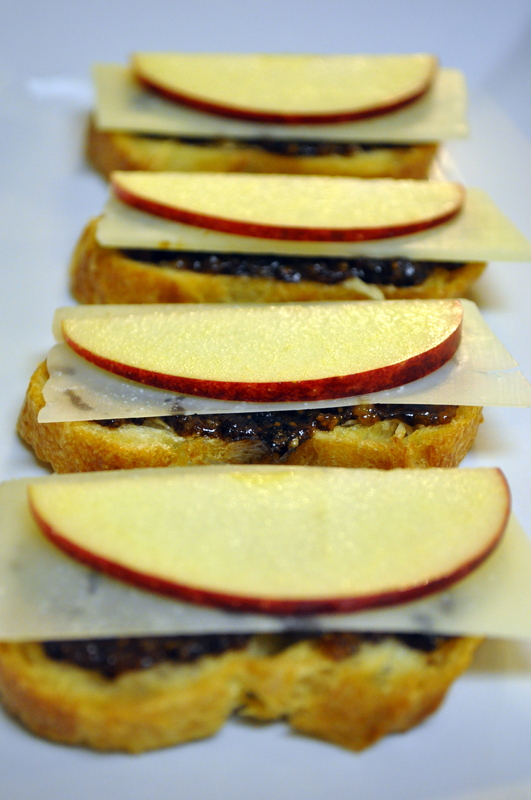 If you have friends who are on a gluten-free diet simply spread the jam on an apple slice and top with the cheese. These will go fast! Enjoy!